Boat camping is a great way to get out and enjoy the cruising lifestyle, even if your boat isn’t large enough to sleep aboard. Sometimes, no matter the size of your boat, it’s just nice to sleep ashore anyway—on dry, unwavering soil, with nothing between you and the skies above but your tent—even if it’s just for a night or two. Other times, you are limited in who you can bring on your adventures by the number of berths aboard. You can cruise happily with six, seven or more people, but when it comes to bedding down for the night, it’s hard to find space for all those bodies. However, it’s possible to enjoy the company of friends and family aboard while ensuring everyone has a comfortable(ish) place to sleep. All you need to do it is a tent, a sleeping mat, a pillow and a sleeping bag. 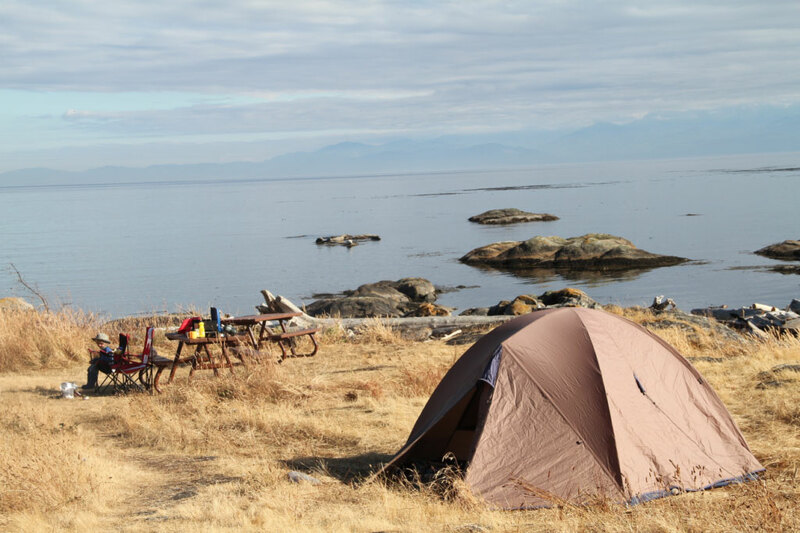 Here are 10 of the best boat-accessible campsites in the Gulf Islands and Howe Sound. In the heart of the Southern Gulf Islands, Wallace is a spot where moving out of the quarterberth and setting up camp is always a good idea. With 18 walk-in campsites at the designated camping areas of Conover Cove, Chivers Point and Cabin Bay there is usually place to set up a tent—although on weekends in the summer Conover Cove can be quite busy. An info shelter provides interesting information about the history of Wallace Island and also lays out the hiking trails, which run to both ends of the island from Conover Cove. Whichever direction you choose to hike, you will end up at a beautiful vista. The shorter hike takes you south to Panther Point (I’m told you can view the wreck of the Panther from the point, but in dozens of trips to the island I have never seen it.) A slightly longer hike to the north ends at Chivers Point. This is a beautiful bluff from which to watch the sunset or have a picnic. There are pit toilets at Conover Cove and Chivers Point and with picnic tables and historical buildings to explore, Wallace is a great camping location. Do not discharge sewage or grey water—it is against park regulations. Ruckle Park, located on Saltspring Island, is the largest provincial campground in the Gulf Islands (529 acres) and is also one of the most idyllic. 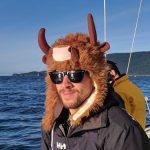 Sprawled along seven kilometres of the southern coast of Saltspring and interspersed among pine and arbutus forest and on the grassy bluffs overlooking Swanson Channel, Ruckle offers something for everyone. Spend the day admiring the views of passing ferries and orca or take a short walk to the Ruckle Heritage Farm, B.C.’s oldest working farm, where you will encounter sheep, lambs, highland cattle, hens and turkeys—plus plenty of deer. Grab a drink or snack from the roadside stand at the farm, but make sure you have change. It goes by the honour-box system. The campsite consists of eight drive-in sites and 78 walk-in sites so there are plenty of places to set up. Unfortunately there isn’t great access for boaters. The small bay on the southeast side of Saltspring Island and adjacent to Ruckle Park does not allow anchoring because of underwater cables and the lone mooring buoy is reserved for park operators. But it’s possible to bus to Ruckle and it’s certainly worth the trip if you are already visiting Ganges or Fulford harbours. This 336-hectare park sits just a couple hundred metres from the waterfront of Nanaimo, yet offers some spectacular camping that will have you feeling like you are at a more remote location. Newcastle has an extensive network of walking and hiking trails that lead to various historic points around the island with spectacular views out to the Strait of Georgia. Camping services make Newcastle a prime location to set up a tent and with plenty of options for getting to the island and plenty of places to moor your boat this spot ranks high. There are walk-in campsites complete with flush toilets and showers (is this glamping?) as well as great facilities for group use and picnicking. Moor your boat at one of the 43 mooring buoys in Mark Bay or tie up at the public dock which has room for over 50 boats then set up camp at one of the 18 walk-in campsites available. These sites are located in the forest, about five minutes from the dock. Mooring Buoy and Dock Facilities Use Fees apply throughout the winter. Maximum length of stay is 14 days per calendar year. 43 new mooring buoys have been installed in Mark Bay. There are two types of mooring buoys. The use of anchors in Mark Bay is not permitted in order to allow for the recovery of sub tidal and inter-tidal marine life in the bay and to better prevent boats from washing ashore. Secure your boat and put away all food to prevent racoons from making a mess. At 31 hectares, Pirates Cove on De Courcy Island is the perfect place to pitch your tent. It’s popular with boaters waiting for slack tide in Dodd Narrows and Gabriola Passage, but it’s more than just a jump-off point. Set up camp on one of the six walk-in tent pads then hit the trails for a little exercise, some beautiful bird watching and to catch up on a little cultural history—the island was once home to the English mystic Brother XII who was the leader of a cult on Vancouver Island in the late 1920s. The Darkwoods Trail is approximately one kilometre and should take about 20 minutes. This trail cuts through the middle of the park and through a stunning Douglas fir ecosystem. The Pylades Trail is about three kilometres long or an hour of shoreline walk with spectacular view of Valdes Island and Pylades Channel. Anchor on the west side of Pirates Cove and stern-tie close to the dinghy dock. You’ll be perfectly situated for access to the nearby campsites (and the two composting toilets) in Pirates Cove Marine Provincial Park. Pirates Cove Marine offers a sheltered anchorage for boaters, as well as two dinghy docks—one on either side of the cove. 97 hectares of parkland, 13 drive-in campsites and 15 walk-in sites plus the amenities at Montague Marina make this campsite one of the best in the Southern Gulf Islands in spite of the crowds. If there is space, unload at the park dock and then anchor out in Montague Harbour or tie up to one of the 35 mooring buoys before coming ashore. You’ll want to reserve a campsite in advance during the summer season from May 15 to September 6. Once you’ve set up you can enjoy a picnic in the meadow, relax on the beautiful Shell Beach on the north side of the bay or take a walk around Gray Peninsula. In the evening, catch a lift on the Hummingbird Pub Bus and enjoy some pub fare and live music at one of Galiano’s most infamous haunts. Maximum vessel length for the dock is 36 feet. This park has a boat launch, located at the north end of the park, past the drive-in campsites. This snug anchorage in 66-hectare Plumper Cove Provincial Park is located on the northwest side of Keats Island and is one of the oldest marine parks on the B.C. coast. It can be accessed by passenger ferry from Langdale, but is ideal for cruisers looking to pitch a tent on shore. There are eight mooring buoys and six slips on the dock. There are 20 packed dirt and gravel campsites all of which are first come, first served with no reservations accepted. Additional camping facilities include pit toilets, picnic tables and a hand-pump that provides drinking water. The well-maintained hiking trails are worthy of exploration and provide scenic views of Howe Sound and the surrounding mountains. Marine facilities include a dock and mooring buoys plus lots of room for anchoring. Small boats may be pulled up on the shore. Porteau Cove is located about halfway between Horseshoe Bay and Squamish in scenic Howe Sound. It has 16 waterfront walk-in campsites plus mooring buoys and dock facilities available, making it a great location for boat camping. At 56 hectares, including 52 hectares of foreshore, there is plenty of room to spread out and there are plenty of options for ocean-based entertainment including fishing, hiking and windsurfing. This is also a full-amenity park with drinking water, electrical hook-ups, pit and flush toilets, picnic areas and campfires all available. This area can get busy, but with so much to do you probably won’t even notice the other people. There is only one mooring buoy in Porteau Cove, but the dock is available to visiting boaters. Halkett Bay is located on the southeast corner of Gambier Island. Like Porteau Cove, Halkett offers cruising and camping amenities ideal for transitioning from boat to tent and back. Once settled into one of the campsites, explore the shoreline and inland areas in search of bald eagles, western red-backed salamanders, flying squirrels, black-tailed deer and mink. There are three developed boat-access-only campsites with picnic tables and a pit toilet. These three sites are accessible all year. A single mooring buoy and a dinghy dock are available at a fee and there is good anchorage in Halkett Bay. Hiking, swimming and kayaking are all fun activities at Halkett Bay. Only dinghies are permitted to tie up at the dock. Tying up at log booms in the bay is not recommended as the booms can be towed away at any time. This is one of the most beautiful and relaxing anchorages in the Gulf Islands. Drop the hook and make your way ashore to one of the seven walk-in campsites just up from the bay. The first come, first served tent pads are well-placed in the trees and in a grassy field. This is a rugged site with no drinking water access so make sure you pack enough with you. There are pit toilets and picnic tables. Pleasant walking on the trails and quiet roads in and around this Gulf Islands National Park Reserve will lead you through some very pleasant Gulf Island countryside and you can also hike to the top of Mount Warburton Pike, the tallest peak in the Gulf Islands. There are no mooring buoys in Narvaez Bay. Anchorage is good, but the bay is open to southeasterlies. Located in the Strait of Georgia near the east end of Saturna Island, this island is part of the Gulf Islands National Park Reserve and has five wilderness campsites. The white sandy beach is perfect for sun-tanning and with few people willing to make the trip to remote Cabbage Island, you will be rewarded with seclusion and serenity. Another highlight of Cabbage is the wildlife. It’s a breeding ground for oystercatchers and bald eagles so take care to avoid disturbing nests, particularly oystercatcher nests, which are usually found on beaches. Mooring buoys are available in nearby Reef Harbour.